Homeland Security Investigations agents arrest an individual in Oakland today. 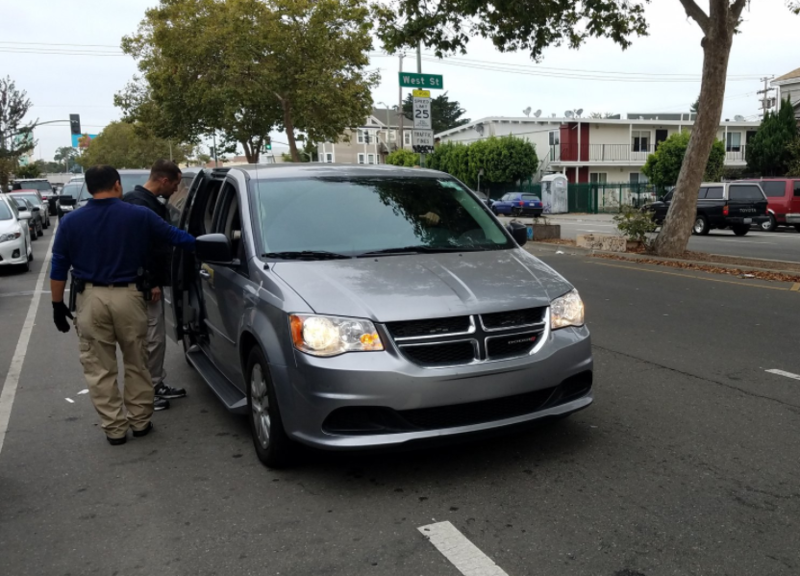 At around 7 a.m. this morning, federal police with the Department of Homeland Security's Homeland Security Investigations unit (HSI) served a warrant at 715 27th Street in West Oakland. Several Oakland police officers assisted the federal agents by blocking off traffic and creating a perimeter. OPD was involved despite a directive from the city council last month rescinding the department's authorization to work under the terms of a recently signed agreement between the agencies. It's unclear, however, if OPD's involvement conflicted with the council's wishes. James Schwab, spokesperson for Immigration and Customs Enforcement's San Francisco office confirmed the joint operation, telling the Express in an email that, "Special agents with U.S. Immigration and Customs Enforcement’s (ICE) Homeland Security Investigations (HSI) are executing a federal search warrant this morning as part of an ongoing criminal investigation." Schwab called it an active investigation and wrote that he could not provide any further details at this time. HSI is the investigative branch of ICE. They enforce laws against drug and weapons smuggling, human trafficking, fraud, and other transnational crimes, as well as undocumented immigration. Neighbors who witnessed the operation said it involved about a dozen federal agents in plain clothes, some wearing what appeared to be body armor. At least one Oakland police officer was stationed on 27th Street at West Street to block traffic. Another OPD officer was stationed in front of the house where the warrant was served. OPD Public Information Officer Johnna Watson confirmed in an email that OPD "conducted traffic control while HSI conducted a follow up criminal investigation this morning." Watson did not provide further information about the nature of the operation and said HSI is the primary agency in charge. Another witness named Jesse, who lives nearby, said he could briefly see inside the house where the warrant was served and that he saw several people were in handcuffs. He asked that we not use his last name. Jesse said the residents of the home are Latino, possibly from Guatemala. "One person was taken away in handcuffs by homeland security agents," Jesse added. Two other people were also allowed to leave the house on their own and drove away from the area. Last month, the Oakland City Council voted to rescind authorization for OPD to work with ICE and HSI investigators under the terms of existing agreements. OPD has signed at least two memorandums of understanding with ICE in the past allowing Oakland cops to work as task force agents under ICE's supervision, and also to allow OPD to be reimbursed when its officers assist ICE agents in investigations and arrests. OPD and ICE signed an agreement in June of 2016, and another agreement was signed in January of this year to allow Oakland to be reimbursed by ICE when OPD provides "resources to joint operations/task forces." The council's action revoked OPD officers ability to be deputized as HSI task force agents and prevents OPD from being reimbursed for joint operations involving OPD personnel. It does not appear to bar OPD from working with ICE in other ways, however. OPD officials said in an emailed statement that the traffic control and perimeter they established for today's ICE operation was not in conflict with the city council resolution. The City of Oakland has yet to respond to a recently filed Public Records Act request seeking a copy of the notice terminating the agreement between ICE and OPD. "Today, August 16, 2017, at approximately 6:30 a.m., Homeland Security Investigations (HSI) served a federal criminal search warrant in connection with human trafficking of juveniles in our city ( 700 block of 27th Street). HSI is conducting a criminal investigation, not a civil immigration or deportation action. This branch focuses on Transnational Gangs, Human Trafficking, Human Smuggling, Child Exploitation and Narcotic Enforcement. Yesterday, HSI headquarters in San Francisco contacted Oakland Police Chief Anne E. Kirkpatrick and requested two police officers to assist with traffic control. Chief Kirkpatrick gave strict instructions to the commander and officers that they may not assist HSI with any enforcement efforts. The officers’ only role was that of traffic control and neighborhood safety. Although the Oakland Police Department no longer has a contract (MOU) to actively participate in investigations with HSI, the Department may assist our local, state, and federal agencies when requested as it pertains to traffic control, community safety and officer safety. HSI is the primary investigating agency." ICE officials declined to release information about who was arrested today, and what they are charged with. A request for a copy of the arrest warrants was also declined.